Millennials are leaving the church. Nearly six in ten (59%) young people who grow up in Christian churches end up walking away, and the unchurched segment among Millennials has increased in the last decade from 44% to 52%, mirroring a larger cultural trend away from churchgoing in America. When asked what has helped their faith grow, “church” does not make even the top 10 factors. Young Americans are attempting to learn faithfulness in a rapidly changing post-Christian culture where they are rethinking the institutions—like church—that arbitrate life. The ubiquity and onslaught of information and competing worldviews, as well as a greater resistance to the gospel among their peers make it harder for young people to find meaning in a complex culture. But the good news is that the research we conducted for Youth Specialties and YouthWorks points to a strong correlation between good, integrated youth ministry and staying active in church. Youth Specialties and YouthWorks, commissioned Barna Group to conduct both qualitative and quantitative research among senior pastors and youth ministry leaders to assess the state of youth ministry in America. This is the first wave of a multi-year project which will be fully released at Youth Specialties’ National Youth Workers Convention this November in Cincinnati. These organizations seek to help churches increase their ministry to teenagers through mission trips and youth worker training. The most unchurched Americans are Millennials, so it comes as no surprise that youth ministry is a priority for many churches. Six in 10 (61%) senior pastors say youth ministry is “one of the top priorities” of their church’s ministry, and 7 percent say it is the single highest priority. However, despite a clear majority, one-third of pastors (32%) say it is either somewhat, not too much, or not at all a priority. Interestingly, the level of priority among pastors correlated very highly with the size of the youth group: churches that have not made youth ministry a priority tend to have smaller youth groups. This does not prove causation, but suggests a connection between youth group size and prioritization. Pastors at churches with a youth ministry of 50 or more students and pastors at churches with 25 to 49 students are more likely than average to say youth ministry is one of their church’s top priorities (81% and 71%, respectively). At churches where youth ministry attendance is one to 10 students, pastors are more likely than average to say youth ministry is somewhat (42%) or not too much of a priority (7%). Churches with larger youth groups are often more willing to invest in the program by increasing staffing and budgets. Churches with a smaller youth group tend to be less willing to invest resources into youth ministry. The sentiment is, for the most part, shared among youth ministry leaders. A majority (66%) say it is one of the top few priorities among the leadership of their church, but only 1 percent say it’s the single highest priority (6 percent less than senior pastors). Again, about one-third say youth ministry is a secondary priority among church leadership (29%), or not at all (4%). Despite youth leaders feeling less like their ministry is a top priority compared to the perception among pastors (1% compared to 7%), there is a fair amount of consistency between them. 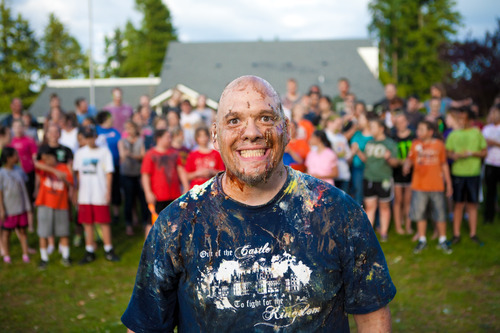 Although youth ministry is seldom the highest priority in the ministry of a church, it nonetheless appears to remain high on the list among church leadership. When it comes to the purpose of youth ministry, the two priorities among youth pastors of large churches are “discipleship and spiritual instruction” (75%), and “building relationships” (48%). No other priority was listed by even one-quarter of respondents. The next-highest priority, mentioned by one-fifth of youth leaders (20%) was evangelism and outreach. Our research also looked into the value of immersive programs, outside of weekly youth activities—specifically camps, retreats and missions. Leaders say the most important of these is youth mission trips (74%), which are in a class by themselves in terms of importance. This is followed by overnight retreats (45%), weeklong camps (43%), family mission trips (35%) and large youth conferences (23%). Overall, 88% of the youth ministry leaders interviewed say they offer mission trips as part of their youth programs. These are most commonly inside the U.S., but 57% of the leaders who have taken such trips have done so outside the U.S. Also among those who offer mission trips, 42% say they offer trips specifically designed for an entire family to participate. These findings are backed up by senior pastors, who were asked to rank the importance of five elements of youth ministry. The top-rated element is youth mission trips (61% say this is very important) followed by week-long camps (55%). Family mission trips (46%), overnight retreats (39%) and large youth events such as conferences (34%) are less important. The major challenges mentioned by youth pastors in Barna’s qualitative interviews tended to revolve around the idea of youth ministries as a consumer product that is evaluated by parents and students just like any other consumer experience. That is, leaders talk about a lack of student leadership or ownership, and a lack of involvement by the parents. Even for youth groups in which most parents attend the church, pastors still often feel they do not take sufficient ownership. Similarly, among youth ministry leaders in the quantitative survey, the biggest challenge by far is the busyness of youth (86%). Next is lack of interest from parents (41%), breakdown of families (31%), lack of adult volunteers (22%), lack of interest among youth (20%) and lack of youth taking leadership roles (19%). Notably, lack of financial resources is only mentioned by 8% of leaders. Most senior pastors are passionate about the future possibilities of youth ministry, but this is generally connected with their belief that their church is going to grow, rather than to clear strategies and anticipation of future staffing and development. The market for mission trips—locally, domestically and internationally—appears to be strong due to the perception among youth leaders and senior pastors that their impact is noteworthy. It will be important for youth ministry leaders and pastors to make strong connections to the outcomes they are attempting to create, such as discipleship, spiritual instruction and relationships. While there are many aspects of youth ministry that seem to be strong and “business as usual,” the fact that Millennials continue to leave the church—in larger numbers than ever before—when they reach adulthood, suggests a need to either revise current approaches or double-down on efforts to equip and prepare today’s youth. The fact that teens lack commitment due to general busyness, and the broad scarcity of student leaders, suggests that relationships and engagement in church are not reaching sufficient depth. Youth leaders are right to prioritize discipleship and relationship building. Continuing to promote deeper involvement and commitment may stem the losses the church is facing. For example, more one-on-one mentoring may prove an effective approach to building a firmer foundation. Or new, creative approaches may be called for, such as sponsoring teens for pre-college gap year programs. Whatever the strategy, it is clear youth leaders face great challenges as they seek to engage today’s teens in today’s culture. But it’s precisely because of these challenges that youth ministry is so critical to the church today. This study included 463 completed online surveys among a randomly selected sample of youth pastors nationwide. The survey was conducted from October 7 through October 25, 2013. The sampling error for the data is plus or minus 4.6 percentage points at the 95% confidence level. The data contained in this report originated through a research study conducted by Barna Group of Ventura, California. The questions were commissioned by Youth Specialties and YouthWorks. The PastorPollSMincluded 601 telephone interviews conducted among a representative sample of senior pastors of Protestant churches from within the continental U.S. The telephone interviews were conducted from September 20 to October 9, 2013. The sampling error for PastorPollSM is plus or minus 4 percentage points at the 95% confidence level. Youth Specialties is a ministry that equips youth workers and youth with relevant tools and training so today’s teens can find and follow Jesus. To learn more, visit youthspecialties.com. YouthWorks exists to connect teenagers to God, each other, and communities through life-changing, Christ-centered mission trips. To learn more, visit youthworks.com.